Charley May, ( https://www.charleymayflyfishing.com ) passionate fly fisher and part-time guide spills the beans on Girls Gone Fly Fishing 2018. Until recently, I thought I was the only female fly fisher in Australia because I’d never seen another woman out on the water. 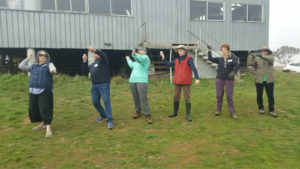 But that all changed when I was introduced to Val Young and discovered Girls Gone Fly Fishing.Girls Gone Fly Fishing (GGFF) is an initiative started by Val and a handful of other passionate fly anglers committed to growing the Australian female fly fishing community. 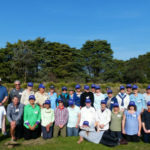 Every year since 2015 the Girls Gone Fly Fishing team host a women’s fly fishing event at Peter Hayes’s (legendary Australian fly angler) lodge in Cressy, Tasmania. So, when Val invited me to take part in the 2018 shindig I jumped at the chance. 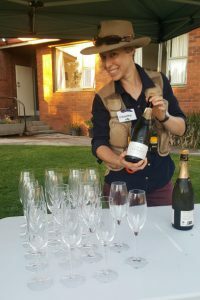 It was an incredible weekend of fun and friendship, and I’d like to share my experience in the hope that it inspires more women to get into fly fishing. Thank god for strong coffee because I certainly needed it after a crappy nights sleep (aka an unsettled baby) and an early morning departure from Melbourne. But as we touched down to a blue sky day in Launceston all that became a distant memory. After leaving the plane, I saw a voicemail from Peter Hayes: “They’ll be two other ladies catching a lift with you. Look out for them in the baggage lounge”. They weren’t hard to spot — the Akubras and fishing rods were a dead give away. Dorothy and Sheena had come from the Northern Territory and New South Wales respectively, and were just as excited as me about the adventure ahead. We were picked up by the wonderful Di (one of the awesome chicks helping out at the GGFF weekend) and whisked to Cressy. Cressy is a cute little village that’s set below the towering Central Highlands Plateau — home to the Great Lake and other fishing meccas. I particularly liked the trout shaped street signs … a signal that we were in serious angling country! When we rocked up at Peter’s lodge the vibe was relaxed and welcoming. 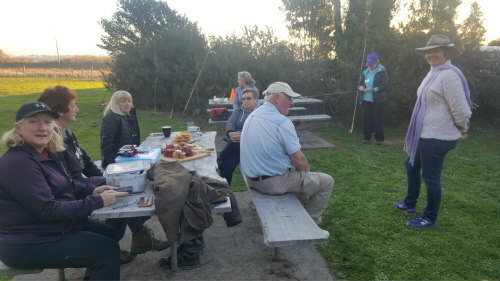 The weather was divine and there were around 25 women soaking up the sun, practicing their casting on the pond, and nattering over bowls of beautiful homemade pumpkin soup. So, I dumped my bags and joined the fun. I even managed to catch two redfin and hook up (and unfortunately lose) a decent rainbow trout — not bad for a morning’s work. Come 5 o’clock, the sparkling wine was popped and Girls Gone Fly Fishing 2018 had officially started. There was a lot to celebrate because I’d also just found out that I’d landed a dream job. Cheers indeed! As the temperature dropped we moved the party inside and I led a discussion on the challenges and opportunities of getting more women into fly fishing. Experiences were shared and some great ideas generated during the discussion with the general feeling being that we need to get girls hooked early and give them pathways to continue their fishing journey as they get older. This is something I’m going to start working on with others to do better. After Peter outlined the weekend’s program in full, we realised we needed a good night’s sleep so headed to bed. After a blissful night’s sleep and delicious breakfast at the gorgeous Driftwater homestead, I caught a lift with Val and Bob Young back to Peter’s place in the morning. And it was straight to the casting pond with Roy Wybrow to learn how to reach and wiggle mend like a pro. Roy is a Master Casting Instructor with decades of fishing experience under his belt and a cheeky twinkle in his eye so we were in good hands. Learning to mend line is critical if you’re to maintain a nice natural drift on the water when the current tries to grab it. After a series of drills and tuition, I certainly felt like I could do it much better. Then it was over to Peter and Judith Oliver (first female Certified Casting Instructor in the Southern Hemisphere) for some false casting. Peter makes casting look so effortless and graceful. But I guess that’s what happens when you’re an Australian Casting Champion and world famous instructor. I’ve been fly fishing for over two decades but felt I’d elevated my fly casting ability by years in just under an hour with him and Judith. Regardless of our fishing experience, they gave us lessons that helped us control our line and form nice tight loops — the key to good casting. We practiced our casting trajectories, planes, tempos, and targets until we were throwing loops we could all be proud of. I had so many light bulb moments during this session and have been enjoying putting them into practice ever since. After a lovely morning tea, it was time for double hauling with Bob Young (a brilliant Master Casting Instructor and among the nicest fellas I’ve ever met) and Annie Skarratt – Certified Casting Instructor. Oh boy, I struggled with this so much. 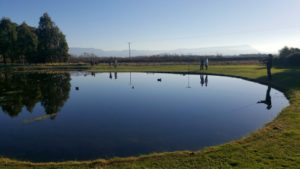 Basically, double hauling involves pulling and releasing line at specific points in the casting stroke to increase the line speed — something that’s very handy if you’re fishing in windy conditions or want to make a lot of distance. For me, double hauling felt like trying to pat your head and rub your tummy at the same time… frustrating! But my persistence and Bob’s incredible patience paid off when I finally got it! Our final exercise was constant tension casting (aka Belgian casting) with Certified Casting Instructor Karen Brooks and legendary cane rod builder and Certified Casting Instructor Dave ‘Bamboo’ Hemmings. This casting technique involves a wide arm side backcast that is then delivered in a straight overhead forward cast. Properly executed, it keeps the line under constant ‘tension’ and prevents any slack developing that can happen with pick up and lay down casts. Belgian casting is really useful when fishing big nymphs or teams of nymphs because it helps prevent tangles or jerky presentations. I got to grips with the technique quickly thanks to Dave and Karen’s tuition — which is just as well because I was hanging for a beer! 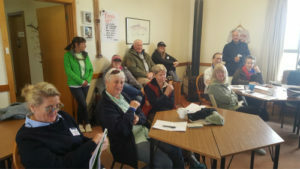 Saturday ended with a brilliant presentation from Dorothée ‘Dundee’ Williams about saltwater fly fishing. A champion angler and professional fishing guide at Insight Fly Fishing, Dorothée set up a legendary fishing camp called ‘The Barra Base’ on the Tiwi Islands near Darwin. Her tales of close encounters with fierce crocs, battles with big fish, plane crashes, and running a business in a truly remote part of Australia was incredibly inspiring. I want to be just like Dorothée when I grow up! Sore muscles welcomed in Sunday, and after a quick cuppa and a chat with the girls it was back to business. Luckily, the first session was ‘knots and leaders’ so we could sit down and twiddle with rope next to a crackling fire. This is a very important subject because you need to know what and how to attach things to your fly line in order to successfully catch fish. Uni knots, triple surgeon’s knots, blood knots, nail knots, and improved clinch knots were among the tangles we mastered. We discussed the properties of fly line and leaders, and why it is important to spend a little extra on good brands. If you want to know, just ask someone who’s snapped off a good fish because they decided to save money — I can tell you, it’s not worth it! Next up, it’s line management with Peter. It’s clearly something Peter feels very passionate about because he was emphatic we get this right. And it’s true, having heaps of line by your feet, or being carried down by the river current is a surefire way to get all tangled up and lose fish. I found the easiest way to manage my line was to adopt a ‘west side’ like gang sign with my left hand and loop the line across the middle fingers of my sign while using my index finger to strip and gather line around. It’s pretty tricky stuff but I can see how it becomes second nature with practice. And that’s something I promise to do because there have been times when my out of control line has got the better of me. The last exercise was called ‘rod speed dating’ by Louise Christison because it involved getting to know six completely different rods in just two minutes. Why you may ask? Well, like people, fly rods are completely different, and in order to find your perfect fit you need to know what you’re dealing with. Some rods are very flexible, some quite stiff, some bend just at the tip, some bend the length of the rod, some are made of wood, some of fibreglass, some of graphite — and all of this affects how the rod ‘feels’. And this feeling is very important because when we find a rod we gel with good things are likely to happen. So, after a good long chat with the gang I settle on two rods I’d like to take home — a cheap and cheeky fibreglass number you could have carefree fun with, and a graceful Douglas 7’6, 3wt you could introduce your mum to. My watch strikes 4 o’clock and my return flight to Melbourne calls. The weekend went way too fast! After doing multiple rounds of hugs and thank-yous, I reluctantly jumped in the car and smiled all the way to the airport as I recalled the friendships I’d made and the fun I’d had learning so much about my favourite pursuit. I can’t wait to go back next year! Before I sign off, I’d just like to thank the following people for their contribution to this awesome event. 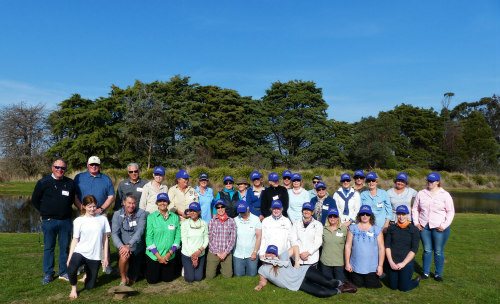 Peter Hayes, Maddy Hayes, Lachlan Hayes, Jenny Girvan, Val Young, Bob Young, Annie Skarratt, Karen Brooks, Roy Wybrow, Dianne Kalweit, Judith Oliver, Dorothée Williams, and Dave Hemmings. Thank you so much for your tireless work in making Girls Gone Fly Fishing such awesome event. Look forward to seeing you again in 2019. Tasmanian Inland Fisheries Service who stocked the casting pond and provided free fishing permits for all the GGFF event participants. Judith Oliver a Certified Casting Instructor and general legend who provided raffle prizes (beautiful hand-tied flies).